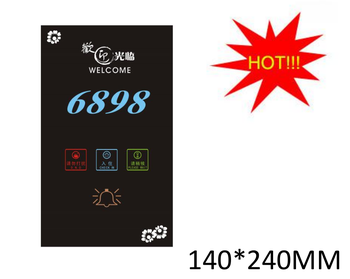 Three-in-one hotel doorplate, 3 in 1 hotel doorbell, with make up room and don't disturb, 220V/110V AC or 12V DC. 1. 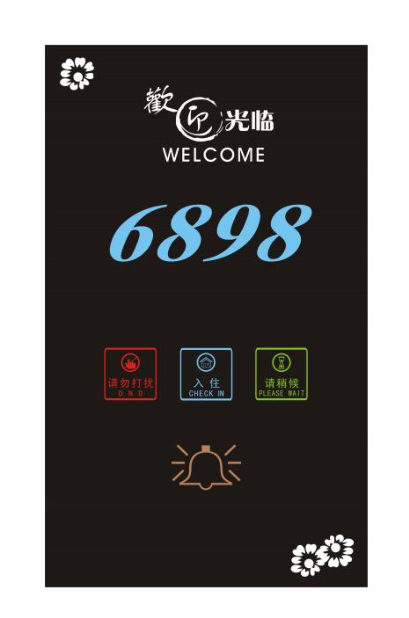 In normal conditions, press the button "doorbell" of touch screen to open the bell, and the guests will know there are visitors at the door when hear the euphonious ring. 2. The guests press the button” do not disturb" switch, touch screen's "do not disturb " sign backlight was lit. the display outdoor prompts "please do not bother," At the time being, the doorbell button does not work, the doorbell outside the wall does not work either. 3. The guests press the button” please clean" switch, touch screen's "Please clear" sign backlight was lit, the display outside prompt "need to be cleaned up"; when the guests left the room to take the door card away, the display outside "Please clean-up" is still lit, so that room attendants can clearly aware of the request to need to be cleaned up. 4. When the hotel guest is inconvenient to meet the visitors, they can press the "Please wait" switch, or press "Please wait" button, the sign "Please wait" of touch screen backlight flashing, suggesting that the guests outside “Please wait a moment” and doorbell button failure, 2 minutes later, "Please wait," restore a dark backlight automatically. 1.Five-in-one doorbell system combination (large room number, Strong power, economical) effectively solved hotel rooms status, room number,doorbell, intelligent electricity/energy-saving and so on.The big room doorbell panel,the doorbell controller switch, special card for special energy-saving switche,the original recording doorbell form a simple and the most economical guest room control system. 2.Big room number doorbell LCD screen display white back light of room number,top grade and taste,convenient for guset to recognize room in nighttime and waiter to know the room status,as well as cleaner to understand guest room status through observe the doorbell indicator light to know "whether anyone in the room" and "Do not disturb" or "Make up room" etc.When the guest leave room and pull out the room card,then the energy-saving switch delay 8-12 seconds and automatically cut off the power supply,such room always can give hotel brings direct economical benefits (save hotel a lot of electric charge) and prolong guest room various appliances service life,promote room electric use safety coefficient,and positive response of a global "energy" call. Shenzhen Fox Intelligence Technology Co., Ltd.